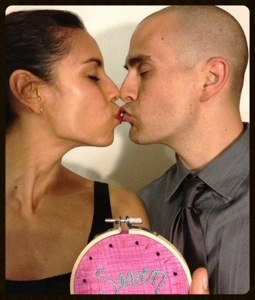 Well, this weekend marked our 7th anniversary of being man and wife! 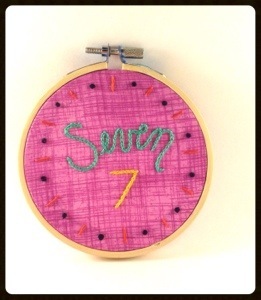 SEVEN! 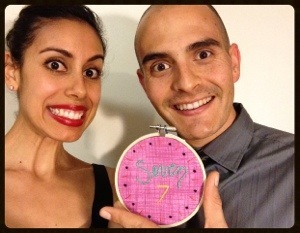 Although those 7 years feel as if they went by in a blink of an eye, it also feels as if we’ve been married forever (not in a bad way)! Let’s start out at the beginning. Saturday was pretty uneventful. I taught my aerobics class, as usual, did some household shopping, and tried to relax (as best I know how). 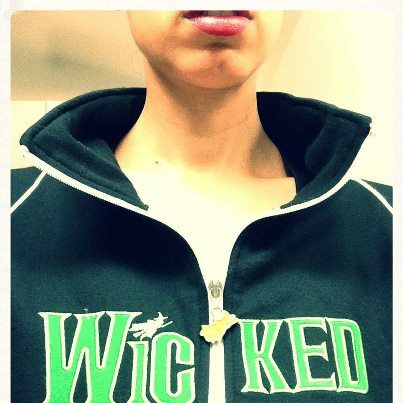 All day Saturday I wore my Wicked jacket in protest of Oz the Great and Powerful; childish perhaps, but I felt that it was necessary. 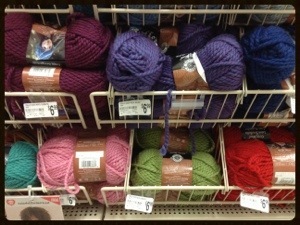 While in my protest garb I did some supply shopping at Joann/Michael’s and took a little stroll down the yarn aisle, which I haven’t done in quite some time. I absolutely fell in love with these skeins, the colors are adorable. I’m working on getting my 82 year old neighbor to crochet a cute little Afghan for me. We trade craft/bake projects every now and then. She is amazing and always downplays her skill but she is extremely talented. 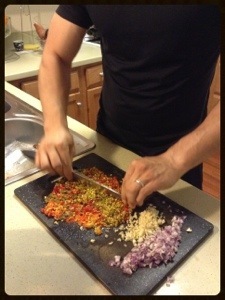 I came home to the lovely sight of my husband preparing green chile. This is his art form. 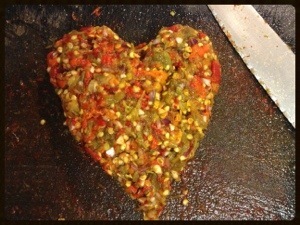 And just to fit in the theme of our anniversary weekend, he indulged me by creating a heart-shaped chile. I finished the day up with some celebratory stitching. What do you think? I actually had a lot of fun making these two. 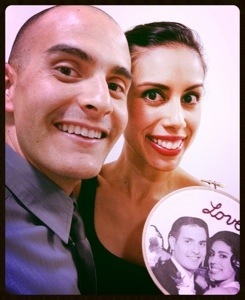 That photo on the left has to be one of my favorites from our wedding; we look so young! Two little babies who thought that they were all grown up! Sunday marked our actual anniversary. 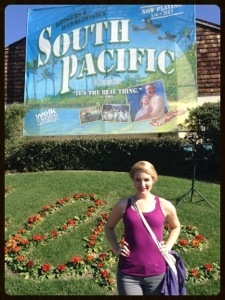 We took a long drive up to the Welk Resort in Escondido where we saw a wonderful performance of South Pacific. This is the first time that either of us had ever seen South Pacific (on stage) and we know the gal who played Nellie (the female lead) so it was extra special! Welk Theatre San Diego is an intimate theatre without a bad seat in the house. Unless, that is, you happened to have our seats. We sat immediately behind a group of six senior women who kept talking; the one on the end must have said ‘I don’t know what’s going on’ about 3 times. We sat to the right of a group of Japanese tourist who nearly took my toes off while walking to their seats. 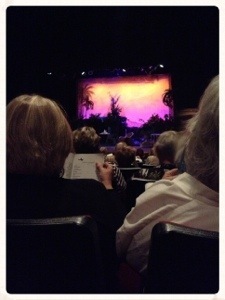 The woman behind us had the audacity to make not one but two phone calls in the middle of the performance! Notice that I said make, not take, she actually made two outgoing calls! 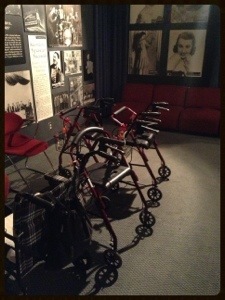 Apparently theatre etiquette was beyond these people. The cast was great, but that was the worst audience that we have ever been a part of. The star of the show was the lovely Hannah M. James. She was absolutely endearing as Nellie Forbush particularly in I’m Gonna Wash That Man. I would love to see Hannah play Ellen in Miss Saigon; I think that she would nail it! Her fellow cast member, Benjamin Lopez would also make a pretty good Chris but one production at a time, I suppose. 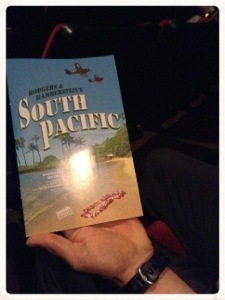 South Pacific runs for one more week, so if you live in the SoCal area, I would highly recommend that you give it a visit. 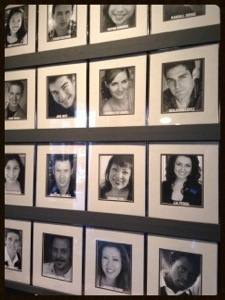 Our theatrical outing was followed by a scrumptious dinner at Fleming’s downtown. Our food was phenomenal! We had sear ahi tuna and crab cakes appetizers which I could have easily eaten as a meal in and of themselves. 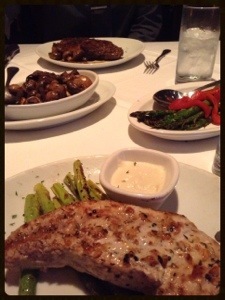 Then I ordered the swordfish and Husband ordered a rib eye. Add in sauteed asparagus and mushrooms and we had the makings of two overly stuffed bellies. We ended the night with a couple of cheesy photos and with our annual viewing of our wedding photo slideshow that my BFF’s husband made for us shortly after our wedding. 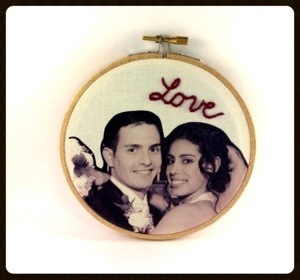 I like this tradition; I think that it’s a good reminder of just how much we loved each other on our wedding day. But I honestly believe that we love each other much more now that we did those seven long years ago. I am not going to sugarcoat our lives and say that every day for the past 7 years has been a magical unicorn ride full of hearts and sparkles. No, marriage is work. It’s give and take on both sides, it’s learning to live with and accept your partner’s quirks. It’s pressing through, not giving up, when things get tough. In our throwaway society, it’s easy just to walk out when it’s no longer convenient, but that is not what marriage is. Sure, Husband and I have had our moments, but we’ve made a lifelong commitment to each other to each other and we intend to uphold that commitment ’til death do us part. I feel so blessed to have had him as my #1 cheerleader for the past 7 years and I look forward to many more! < I Will Send Poppies!